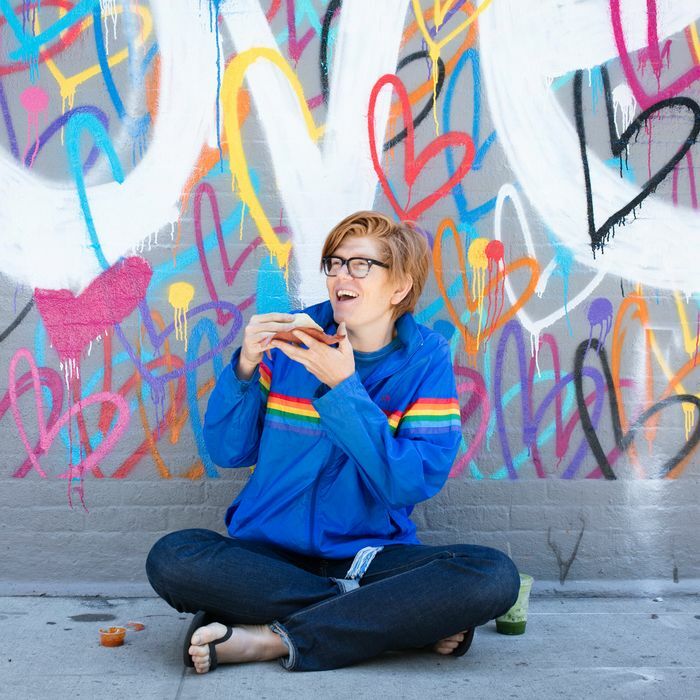 “I wouldn’t call myself a ‘food connoisseur,’ but I love to eat,” says Brett Dennen. This week he was on the road promoting his new album, Por Favor, which means stops in several different places before arriving in New York. “I’m not the kind of guy that’s like, ‘I’m going to this city, so I have to eat at this restaurant.’ I don’t line it all up. I’m more spur of the moment.” A busy schedule means Dennen often has to rely on backstage catering (or smoothies on the tour bus), but he nevertheless found some time to grab a few local specialties this week. Read it all in the latest Grub Street Diet. I started the morning with a radio show. I was in Austin, and the radio programmer promised me he’d bring me the best breakfast tacos. Austin is obviously known for its barbecue, but for breakfast the thing to do is get these tacos. So they brought these ridiculously good black-bean tacos from a place called Tacodeli. I don’t know why they were so good, but they mashed the beans up with all kinds of spices and good stuff, then they throw it in a soft tortilla, and it’s amazing. For lunch I was at a festival called the Cherokee Creek Festival, so I just grabbed the catering backstage. They didn’t have much, but there was a good broccoli salad, with cranberries and onions and olive oil, all chopped up. Like rabbit food, but I ate a bunch of that for lunch. I stayed there for dinner and had veggie fajitas from one of the food vendors at the festival. I try to eat mostly vegetarian, but I mix in some meat and fish. I’m not opposed to meat, but I try to eat it sparingly, more as a seasoning. Breakfast was in the airport. I found a kiosk that had cold-pressed juice, so I had a green juice and these spicy kale chips that they made. I had a whole bag of those chips. We flew from Austin to Greenville, South Carolina, to play a festival. They didn’t give us any food, but the festival had these vendors, and I found a falafel place. I had a nice plate of falafel with tahini and hummus and veggies. We played the show, then went to a sushi place for some sake. Afterwards, dinner was a little weird. I was back on the bus that night. Normally, when I’m rolling on the bus we have a kitchen, and it’s easy, but on this night the pickins were slim. Sometimes it gets tricky on the road, and you have to get creative. There was a kiwi, a couple spoonfuls of flaxseed, a couple spoonfuls of chia seeds, spring water, matcha powder, coconut oil since I’m trying to get good healthy fats into my diet, and some super-green tablets. It was a meal. The bus drove overnight, and I woke up in Fairfax, Virginia. I blended matcha powder with some hot water and added a good amount of hemp seeds and coconut oil. For health reasons, I’ve been doing this thing in the morning where I also add two spoonfuls of this collagen powder, which is like ground-up chicken joints, I think. A doctor told me to start drinking bone broth for health reasons, but it’s impossible to keep bone broth with me on the road, and I don’t know where to find it from town to town. So a friend of mine told me that she drinks this powdered stuff made from bones, so I figured I’d try it. It’s awesome. Altogether it’s like a tea with a ton of protein and fat. It keeps you full for a long time. That show did have a catered lunch, but it was pretty pitiful. There was a chickpea, farro, and onion salad. It wasn’t bad, but it wasn’t great. I doctored it up with some Texas Pete hot sauce. We were opening for the Avett Brothers at the George Mason University arena. I’ve been on some tours, like opening for Dave Matthews and John Mayer. Those guys hire this company called Dega, and when they have backstage catering it’s amazing. There’s a juice bar, and a salad bar, multiple entrée options, coffee bar, and there’s food out all day. But this was pretty skimpy. So dinner, also from the same catering company, was a plate of mashed potatoes. I played the show and had some red wine. I was still hungry, so I took a banana and some spinach on the bus and blended that up with hemp seeds and coconut oil. We woke up in Secaucus across the river. Before we came into the city, I made a really dense smoothie: three fistfuls of spinach, one banana, a nub of ginger, two carrots, two spoonfuls of flaxseed, spring water, and some cabbage. I had some matcha as well. In the city we were setting up and sound-checking in the McKittrick Hotel, so for lunch I went to a little diner. I got a diner salad, a side of rice and beans, and steamed “garden” vegetables. I don’t know what garden they came from, but it seemed like “garden” in this case probably meant the freezer. I also got an extra serving of attitude. The server was like, “You’re going to eat all that? The salad’s really big.” But I didn’t care, I just wanted those things. It was kind of a cliché, but that’s why I had to put it in here. That night the label was paying for dinner, and we went to this amazing Basque restaurant called Txikito. We just ordered a ton of stuff. There were a bunch of sardines and anchovies; there was this pork sausage floating around, and a ridiculous arugula salad that had crispy onions on top, and it was served with a poached egg. It was really good. That place is awesome. It was the most foodie I’ve been all week. I had to leave early, but apparently after I left they brought out a whole suckling pig, so it’s probably good that I wasn’t there because I might have been a little freaked out. After the show I had some tequila backstage, then we went up to the rooftop at the McKittrick. I was still hungry when we got back to the hotel, so we went to a falafel cart. I wanted some falafel with rice, but the guy said they only had a little falafel left. So I just had him throw a little lamb on there. So far so good. I don’t mess around with the white sauce, though. I woke up and made myself matcha in the hotel, then I had to go to CBS to tape the Morning Show. So for breakfast I just ate a bunch of pineapple that they had. For lunch I went to this place called the Pennsy near Penn Station. It’s the only good place I know of to eat around there. There’s a place in there called the Little Beet. They made a really good lentil patty on top of quinoa-beet salad and soba noodles with shiitake mushrooms. It was all just one big bowl. I’m not really sure what else I’m going to do while I’m in New York, but usually when I’m in town I’m on the hunt for sushi, and I haven’t gotten any yet. There’s also a great vegan-food scene here, so I might try and check that out.